discovered that my stock shocks are ready for service. I am savvy w/ tools. I have acceptable tools. 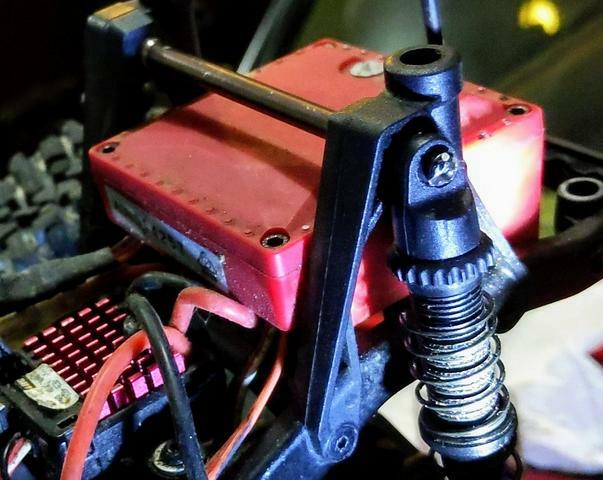 I am very familiar w/ many types of fasteners & tools for things automotive ,including -now- a little about scale rcs ( thanks in no small part to many of you)- so, w/ that in mind , may I humbly ask you to help a newb understand ..
What on this Earth has got to happen for the upper shock mount- bar Allen-head bolts to be extracted? Do I need to take needle-nose vicegrips w/ some tubing to prevent marring the crossbar but keep it from spinning?! I have replacement bolts so , if you look you can see I went at it - gently!- w/ the Dremel. Of course, before asking here...derp. 'doesn't matter because two screwdrivers held opposite one another , counter turning ( & I'm not a weakling) STILL did not unfix these two boogers. Can the dhockbolts up top bend within the crossbar and seize? I do beat mercilessly on the thing but the fronts came out no prob.. The bolts must be locktite in? first time I took mine apart I did need to hold the tube to stop it from spinning, but the bolts were not overly tight or hard to get out. A little heat on tube might help melt the loctite, not too much heat or you will start melting the plastic bits! Must be quite a bit of Loctite as Dean said, use some heat on it. As last resort cut the screw heads off to get it apart and put more heat on the screw pieces leftover, use pliers if you need to. I've loctitied all mine and the allen driver with pliers gently holding aluminum cross member has been plenty to disassemble. Vice grips on the tube, you can pad them with a rag if you’re worried about scratching it. A solder iron would create sufficient heat to loosen the loctite. Just a little heat at a time to avoid melting the shock mounts as noted earlier. Thanks y'all. I'll update with results . They musta had a little extra loctite that day 'cause I purportedly have gorrilla grip & I can't even budge these things. I'm fearful of that red box with the Spektrum in it just beneath. I've noticed something that I suppose you all probably have long known; even the simplest little thing on these scale RCs find it winding-up being a complicated , busy , PITA...mostly beause everything's so tiny & close together! You could easily pull the receiver out of the box, or move it, until you are done applying heat. A quick blast from a hair dryer or heat gun should be enough to loosen the loctite without damaging the shock mount or other plastic parts. When I find a stuck screw I just whip out the bic-click and run the flame under it a couple of times...presto! But then I'm a master shade-tree monkey. I've got three of these run hard and never 'rebuilt' the shocks. Just open up and top them up with oil, clean them up. They all leak a little. You can get fancy with slime and x-rings and all manner of machinations to try to get them so they don't seep. A good time to check those pistons - how many holes of what size. I'm aware of 3 different versions of shock pistons in them. Do the Trujillo mod while you're in there. Hey, Jeffery! Glad to see you posting over here. Anyway... just wanted to stop by to say hello! You always lead me to the right resources,bud. So, is it likely that anyone can point me to best place to buy one of those threaded , rear upper shock crossbars for the Ascender pictured? I got one side out and have mauled the other to where it might just be best for me to replace the crossbar. RPP have them or am I uppa creek? 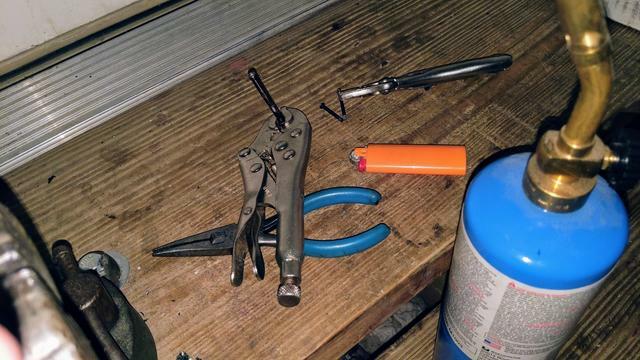 In your case, you might need to remove the receiver box in order to use the shock pliers. What great suggestions & help. Thanks you guys. From the shock pliers to the part itself this forum is the bomb. Some Ascender parts are on sale here in Australia, including the 61mm links. ...there really was 3x the loctite on that side. FML. I just use a hammer. Check; now adding ' hammer' and ' blowtorch' to list of tools needed to replace stock shockoil on Ascenders. This is why I hat working on cars, whether they be 1:1 or 1/10. "Cool. That's easy. I'm no pro mechanic, but I can turn a wrench. Even a monkey can do that. I got this." Fastener either does not budge, strips, breaks, disappears, etc. Ya, thanks that's cool of you. I got a set just to have an extra.